Girls can create trendy, customize fashions using their tablet or home computer! Eight included sheets of printable fabric (8x11.5 Inch) allow designs to go from 2D to 3D! Take or upload photos for totally unique looks! Store and display the fashions in the included portfolio! 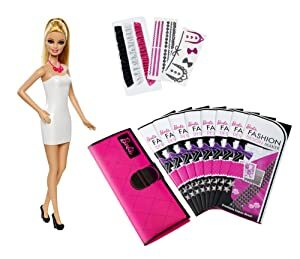 Barbie doll wearing a molded slip, shoes and necklace; eight sheets of printable fabric; one sheet of fabric ruffles; one sheet of glitter trims; one sheet of glitter accessories; and portfolio. Free downloadable design software required for play. Minimum computer requirements for software use: PC/Mac (PC/Mac compatible); 1 GB RAM; latest version of your favorite web browser. For tablet software experience, use: iPad (third and fourth generation), iPad Mini, iPad Mini with Retina, iPad 2.jOS 6.0 and above supported; Android tablets with OS 4.0 and above. Not compatible with mobile phones. iPad, iPad mini and Retina are trademarks of Apple Inc. registered in the U.S. and other countries. Girls can create trendy, customized fashions using their tablet or home computer! Includes eight printable fabric sheets (8”x11.5”) that allow designs to go from 2D to 3D! Click the button below to add the Barbie Fashion Design Maker Doll to your wish list.